One way, is to create element schedule with all needed parameters and add an “Image” field in “Schedule Properties” → “Fields”. Then, you will be able to browse and add an image file (.bmp, .jpg, .jpeg, .tif) to each cell of “Image” column. You can add an actual photo of an element, a front or back elevation view, a plan view or other. This may sound as a good solution but if you want to have an element elevation or plan drawing with its dimensions in the “Image” cell, a few additional steps have to be followed. You will have to create a view (legend or other) of your element elevation or plan with its dimensions and save it as an image (.bmp, .jpg, .jpeg, .tif). Then, you will be able to browse and add it in the “Image” field. Or, you can specify an image to be associated with an instance of a family by editing the Image property. To change the image associated with the family type, edit the Type Image property of the family. This way, images of scheduled elements will appear automatically in the “Image” or “Type Image” field. However, these views will not be in scale, nor will they update if the reflected element has been adjusted. Of course, there is a better way to create an element schedule with front, elevation or plan views that would be in scale and have dimensions. You would have to create a schedule with necessary parameters and a legend view with all elements listed in the schedule. In the legend view, manually add dimensions and marks that will reflect the door marks in the schedule. 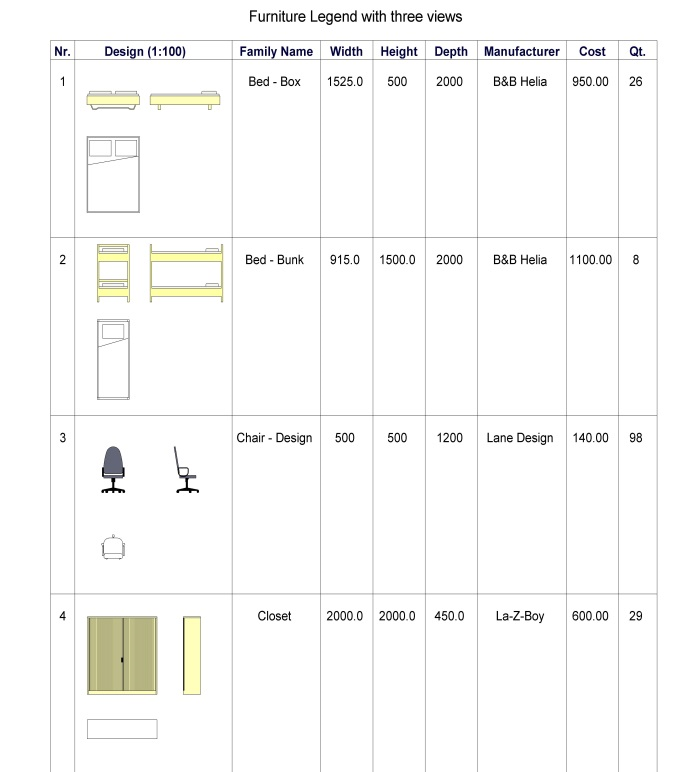 Then, place the schedule and legend views on one sheet and there you go – you have a schedule with element views that are in scale and have dimensions that update automatically. However, manually written marks will not update automatically. Furthermore, element views in the legend view will not be in the schedule table, nor will it be associated with it, so if you would delete or add additional elements, you would have to go to the legend view and add or delete reflecting legend components as well as renumber the elements. In conclusion, this workflow has more automatization, but still – is not completely automatic. Both workflows described above can be used when creating a schedule with element views, but, as you probably already understood, they are not completely automatized. They require a lot of manual work, since you have to add every element image one by one and constantly check for errors, as they do not update automatically and are not linked. Fortunately, there is a way to create a schedule with element images that would be completely automatized. Moreover – you will not even have to create the whole legend manually. All you have to do is draw a block with one or more element views, text and a few lines in a few minutes. Then, using Revit add-in Dynamic Legend – create a legend of all elements of the same category (one or more) automatically. Extension Dynamic Legend creates intelligent legends in Revit that you can update with just one click. It also splits specifications across pages, allows multiple views of any element (including real pictures), and works with linked projects. Legends can be easily modified, updated or re-created at any time. Next, you can continue your work in the “Create/Edit Legend” dialog by adding various parameters, grouping and sorting elements by different criterions. In this convenient dialog you can find elements, also filter and analyze legend data before creation. Dynamic Legend can combine different family categories into one legend, automatically split a legend into several pages, and add columns with row numbers and grand totals. Using this AGACAD extension for Revit, you can create a legend that depends on the project and updates in one click. 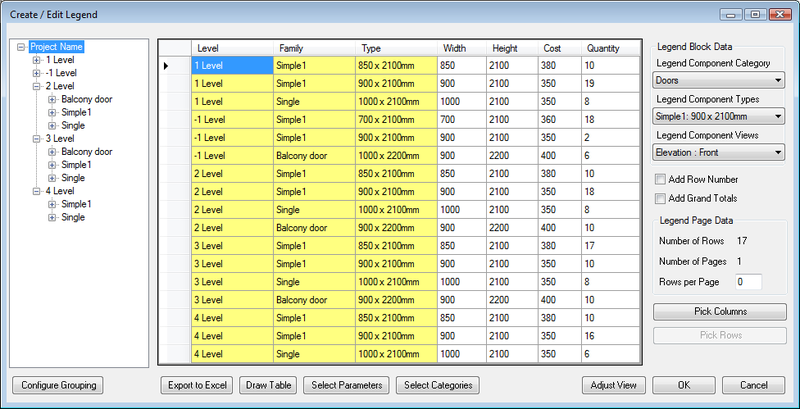 User also has a possibility to change the configuration at any time: change the legend component and its view type: plan, elevation, section or other; remove and add new type or instance parameters; add/remove a row/column number parameter. In conclusion, Revit users will save dozens of hours per project, using Dynamic Legend automation of routine functions on creating legends. This extension helps user to quickly and accurately create legends of families in your design. Revit doesn’t update elements or properties in the legend, so depending on the complexity of the model it can take a long time to create and update all the data in the legend manually. Furthermore, simple software’s interface lets users easily set properties and create desired legend to meet company standards. Don’t hesitate and try Dynamic Legend and other Tools4Revit® plugins that will help you concentrate on work that creates value. Stop wasting your time and let the tools do most of the technical work automatically.